One of the hazards of traveling around the world so much is that you don’t always take time for the simple pleasures of life, like cooking. I’m not much of a cook. I blame this on the fact that everyone else in my family cooks quite well, so learning to cook always seemed rather redundant. I have often said that I will take up cooking whenever I get married or move to Paris, whichever comes first. Well, I am not engaged and I’m not moving to France this year. But since I have already lived in Italy, there is really no excuse for not knowing how to cook. My friends tell me that cooking would actually go very well with my personality and artistic sensibilities. I hope they’re right. Historically, I have been very impatient with long recipes and very clumsy in the kitchen! But I do like cooking movies: Like Water for Chocolate, No Reservations, Julie & Julia. So with that inspiration in mind, I’ll give it a try. I decided to start slowly with a nice plate of pasta. One of my best friends just loaned me an introductory DVD & book set authored by the Italian cook Antonella Clerici. She writes: “Come in ogni preparazione gastronomica, anche un semplice piatto di pasta per essere buono esige che la materia prima sia di ottima qualità.” (As in any culinary preparation, even a simple dish of pasta — in order to be good — requires that the raw materials are of excellent quality.) 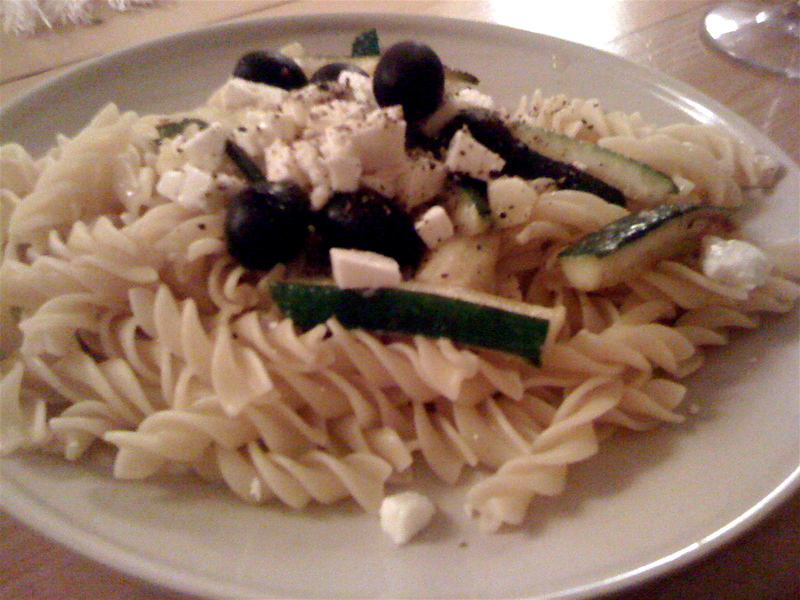 So I went to the market and selected some raw materials: whole grain fusilli noodles, fresh zucchini,virgin olive oil, garlic, black olives, feta cheese, black pepper, etc. As I reached for the cheese, I suddenly caught a vision for a good pasta recipe. I was able to visualize the taste of the pasta (I suppose that’s not a visualization, but rather a gustalization? ), and imagine different flavor combinations. This is probably a routine experience for most people, but for me it was very novel and exciting! As soon as I got home from the market, I watched Antonella’s DVD; she gives some excellent tips, but half of the fun is watching the other Italian cooks argue with each other. “Ma no, fai male!” (But no, you’re doing it wrong!) It cracked me up. I manage to stop laughing long enough to pick up the book. I read that the corkscrew “fusilli” noodles are perfect for absorbing a thick chunky sauce, like pesto or bolognese. Good to know. At about this point, I started to get restless. I felt I had already gleaned enough inspiration to start cooking. Now, it was time for the most important ingredient: opera! Who can cook without good music? So I cranked up my playlist of Puccini arias on Spotify (“Innamorata di Puccini”), uncorked the pinot grigio, and released the noodles from their plastic bag. The soundtrack really helped: I sliced the zucchini to Rudolfo’s declaration of love; the pasta boiled along with Magda’s first kiss; and Butterfly’s distress peaked just as I was throwing the salt and garlic around. Finally — I kid you not — I placed the final olive on my finished plate of pasta just as Pavarotti was singing “Vincerò! Vincerò! Vincerò!” (I shall win, I shall win, I shall win!). So my fusilli al Puccini emerged victorious. I did add just a little bit too much olive oil, but I blame that on Enrico Caruso’s velvety voice. And if I turned up the heat a little too high under my roommate’s frying pan? Definitely Puccini’s fault. Perhaps I should actually follow a recipe next time… or maybe not? I am definitely open to suggestions, if you have a tip for me. Buona notte, ragazzi. This entry was posted in All About Food, All Things Operatic and tagged cooking, opera, pasta, Puccini by Lindsay Westra. Bookmark the permalink. You made me hungry for pasta AND Puccini! This info is the cat’s pmjaaas! Good points all around. Truly apprceitaed.